Where is South Carolina, United States? 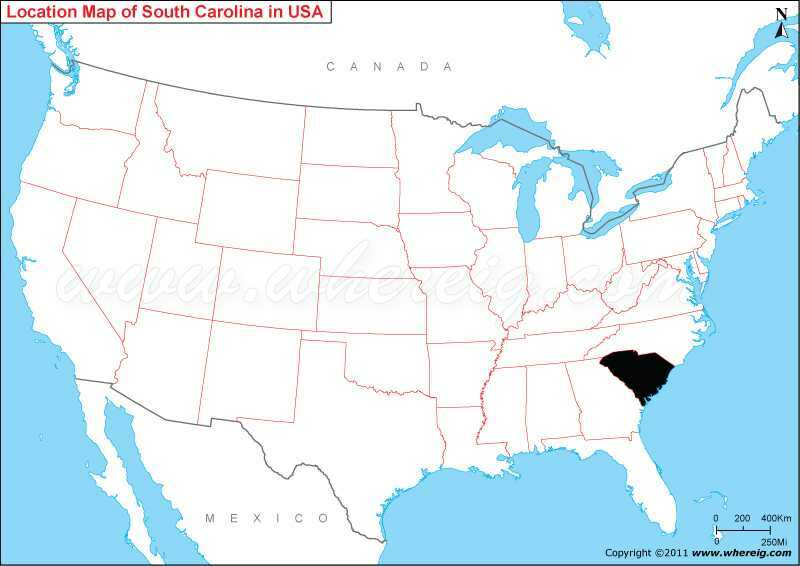 Map showing Where is South Carolina located on the US map. As shown in the given South Carolina location map that South Carolina is located south-eastern region of the United States at the coast of western Atlantic Ocean. South Carolina map also illustrate that it borders with North Carolina in the north and Georgia in the south and south-west. Besides, Atlantic Ocean lies in the eastern side of the state. South Carolina is one of the 13th states that declared independence from British rule. Furthermore, South Carolina was the first state that vote to secede from the Union. Likewise, it is the founding state of the Confederate States of America. Under the humid subtropical climate, the main agriculture practices are tobacco, soybeans, rice, poultry, cattle, dairy products, and hogs and important industries are textile goods, paper products, machinery, chemical products, automobiles, and automotive products and tourism.